Let me start off by saying (if you didn't deduce it from the idea of reaping men's bodies from the ground on which the title is based) this memoir is heavy. Not bad heavy, but Ward gives it enough weight that I stayed in my seat a few minutes after finishing the book, just thinking about it. The weight of Men We Reaped is one that is familiar to me, one I carry as well, and though reading Ward's memoir doesn't alleviate that weight at all for me, there was an incredible satisfaction and comfort to be had in hearing it named, condemned and knowing that someone else was carrying it too. The book opens with an explanation of the chronological device that Ward uses to tell her life story. 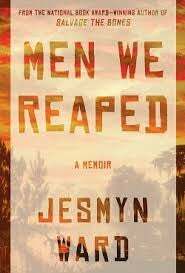 The stories go backwards, from the most recent death, to the earliest and in many ways the backward motion only intensifies the feelings of helplessness Ward describer and the reader begins to feel surrounding the fatal epidemic plaguing poor black men in America. Going back in time with full acknowledgement of her visceral emotional feelings about each section of the book, Ward walks the reader through what feels like the honest truth of the deaths of 5 young men, one of whom is Ward's own brother, in what (on the written page) amounts to barely double the number in years. Death, as Ward writes it, in Men We Reaped in not only unavoidable in reality, but it is inescapable in the pages of her book— the reader knows from the onset what lies ahead and that no sentence written between the covers will change that. Set in Ward's hometown of Delisle, Mississippi, poverty, racism, and systemic injustice are large players— but in no way are they bigger characters than the gregarious, funny, and youthful boys and men Ward so carefully paints for the reader. The true beauty of Men We Reaped, in addition to the eloquently accessible and approachable language, is Wards ability to craft recognizable and relateable individuals out of a narrative that is so often susceptible to stereotype, racism and classism in the American literary conversation. Though blame does (justifiably) make an appearance in Men We Reaped, it's the pain and suffering of the families and more importantly the children who lose their lives and their friends that stays with the reader. Ward is making an important argument, through the telling of these stories— an argument that is embarrassingly still necessary in the face of new year in the United States: systemic racism and classism, and poverty take lives—bright happy lives— and that isn't changing. This memoir is a relatively short read, but one with lasting impact. I would recommend it to anyone who is ready to learn more about a common experience of being young and black in the United States as well as for those, like me who already know and will take comfort in reading the voice of someone who has a platform from which to spread the word. *If you have any suggestions for another book to review, let me know! Sue Monk Kidd's Invention of Wings is next on my list.